'Heads Of The Colored People' Takes On The Pressures Of Being 'The Only One' Nafissa Thompson-Spires' new story collection is full of characters coping with being not just black in a white world — but the only black person in their worlds. She says that's a hard role to fill. It can be a hard role to fill, says author Nafissa Thompson-Spires, "because you are sort of a representative of what people see as black, by virtue of them not having had much exposure to it, there are all these additional pressures on top of the standard pressures of being black in a white world." 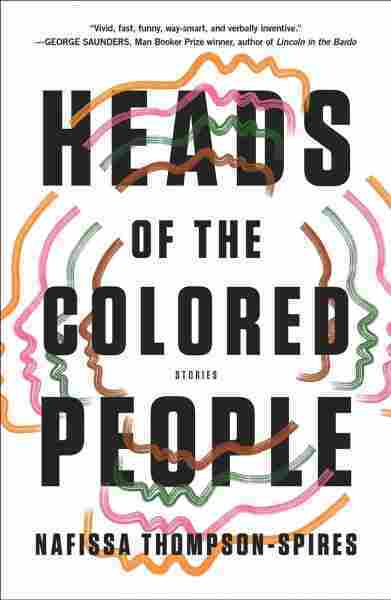 Thompson-Spires' debut short story collection is called Heads of the Colored People, and it's full of characters coping with those pressures. Characters like Randolph, a black professor at a small college. He's exhausted from what he calls "performing his status as an anti-stereotype," as he tries to negotiate terms with a new officemate. "He's unsure all the time, and there's a way that his lack of assurance is very much related to his black identity and his status as a mouthpiece all the time. Having to be a representative in this space," Thompson-Spires says. Randolph is always policing himself — he can't get too angry, because then he'll be seen as a stereotypical angry black man. But he is angry, and he doesn't know how to process it. "So his friend Reggie talks about how his anger has to come out in some kind of way. And for Randolph, it comes out in these passive aggressive antics with his officemate. But for Reggie, he mentions that it comes out in through nosebleeds all the time." On the story "Belles Lettres," told in letters between two mothers whose daughters — Christinia and Fatima — are bullying each other in school. It's basically two very highly-educated black women playing the dozens in this kind of bougie form of the letter. That story actually came from, sadly, something slightly autobiographical — my mother sent me what she called a care packet, that had a bunch of crap from my childhood in it, and there was a letter from my childhood bully's mother in there, talking about what a terrible child I was ... I called my mom immediately, like, why did you send this to me, this is a terrible letter. But with some distance, I thought this really could be funny. So I think that writing this story was somewhat cathartic. I think what Christinia is dealing with, she's responding to Fatima coming into a school where she's been the only black girl, and now there are two of them, feeling some sense of competition with this other black girl. So there's something beyond the hostility that's actually sad ... I do think it's self-hatred, I do think it's being unable to kind of detach your identity from the white gaze, or defining yourself in relation to whiteness. And so she's now defining herself in relation to whiteness and against this other black girl, and it's too many things for a third-grader to deal with, or to even articulate. There is some privilege in that. There's a sense that sometimes you can even blend in to the point that people forget that you are black. But then I think that also has a very dark side, which is that white friends, or friends who are not of color find themselves saying things about black people and forgetting that we're black, too, and saying things like, "you're not like the other ones." I read a lot of humor, I read a lot of great literary fiction and satire ... but I never saw myself reflected in any of those stories, I never saw black characters like me, dealing with being the only one. I've experienced that, in a very negative sense. If you grow up in Southern California, people don't tend to do the nod, the acknowledgement of other black people — but when I moved to the South, it was very important, it seemed like, for black people to be acknowledged by me and to acknowledge me ... You will hear about it, and you will be called uppity, bougie, all kinds of things. And I get it now. Having grown up really isolated from other black kids, I've come to really appreciate just the visibility of other black people. Seeing another black person across the road from me makes me very happy sometimes, and I will do the nod — but that's not the way I grew up. I do think I would have felt less alone. I read a lot of humor, I read a lot of great literary fiction and satire, which is the kind of fiction I like the most, but I never saw myself reflected in any of those stories, I never saw black characters like me, dealing with being the only one. I didn't even see a lot of black nerds, which in a lot of ways is what this collection is about — just black people who are into cosplay and into all kinds of stereotypically dorky things, and I wrote the stories I wished I could have been reading and seeing. This story was produced for radio by Connor Donevan and Selena Simmons-Duffin, and adapted for the Web by Petra Mayer.